It was a genuinely historic day for the people of Derry and an emotional climax to a campaign which has spanned generations. Almost four decades after British soldiers shot dead 14 unarmed men and children on the streets of Derry, the Bloody Sunday families have finally been vindicated before the eyes of the world in their long campaign for the truth. Prime Minister David Cameron officially apologised on Tuesday for the British Army’s “unjustified and unjustifiable” actions on January 30, 1972. After the longest inquiry in British legal history, Mark Saville had confirmed that members of the Parachute Regiment opened fire on dozens of unarmed civilians without warning, despite them posing no threat to soldiers. His report found that some of those killed and injured had been attempting to flee or go to the assistance of the dying when they were shot. One of the dead was killed while crawling away from soldiers, while another was shot when he was lying mortally wounded on the ground. The findings bring to an end a 38 year wait for the truth for the families of the victims after the Widgery report wrongly accused some of those killed of having guns or bombs. Saville, most significantly, finds that the soldiers fired first in the Bogside that day; Widgery had asserted the opposite, using an argument akin to Denning’s ‘appalling vista’. Widgery declared that there was no general breakdown in discipline; Saville says there was “a serious and widespread loss of fire discipline” among the soldiers of support company. Widgery had lauded the soldiers for their “steadiness” and declared that, in his opinion, the accounts they gave of their firing were in general truthful. Saville accuses some of them of falsifying their accounts. However, like Widgery, Saville exonerated General Robert Ford, the then British commander of land forces, and effectively cleared Brigadier MacLellan who gave the order for the arrest operation. As some had predicted over the years, the “fall guy” turned out to be the commanding officer of 1Para, Colonel Derek Wilford, who is simply accused of not complying with his orders. Wilford is retired and living in Belgium and will not be commenting on the findings of the inquiry, according to reports. The British army is believed to have placed a gagging order on all its soldiers in relation to the report. Tony Doherty, whose father Patrick was one of those killed, said the Bloody Sunday families had been vindicated and the Parachute Regiment had been disgraced. 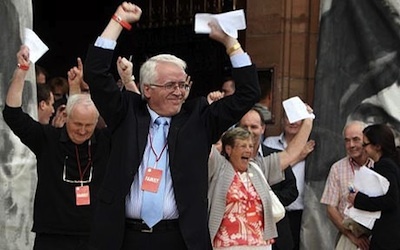 “It can now be proclaimed to the world that the dead and the wounded of Bloody Sunday, civil rights marchers, one and all,were innocent, one and all, gunned down on their own streets by soldiers who had been given to believe that they could kill with perfect impunity,” he told thousands of supporters outside Derry’s Guildhall. On Tuesday morning, the families went inside the Guildhall to receive advance notice of the findings as marchers gathered in the Bogside to retraced the route of the original civil rights protest, carrying giant banners with the faces of the victims. As Cameron prepared to address Westminster on the inquiry’s report, there were emotional and celebratory scenes in Derry as the families appeared at the Guildhall windows, giving a ‘thumbs up’ signal. They then emerged and, one by one, triumphantly declared the findings of innocence of their loved ones to the delighted crowd. Mickey McKinney, brother of 27-year-old William McKinney, who was shot from behind when tending to a wounded man, led the families on to the stage. “This is a historic day for Derry. I’d like to thank you all for your patience, as we have all had patience for 38 years. But today the waiting has come to an end,” he said. The crowd erupted with cheers and clapping before Kay Duddy, sister of 17-year-old Jack Duddy - the first person to be shot dead on Bloody Sunday - called for a minute’s silence to mark the deaths of all those who lost their lives during the Troubles. Tony Doherty, brother of 31-year-old Patrick Doherty, who was shot from behind when trying to crawl to safety in a flat forecourt, said he welcomed British prime minister David Cameron’s comments that all the killings were “unjustified and unjustifiable”. “The victims of Bloody Sunday have been vindicated, and the parachute regiment has been disgraced. Their medals of honour have to be removed,” he said. Mr Doherty said the victims were gunned down in their own streets by soldiers who were given to believe they could act with impunity. He said Widgery’s lies had been “laid bare” by the Saville report, in a reference to the inquiry into the events on Bloody Sunday led by Lord chief justice Widgery in 1972. “Bloody Sunday wounded Derry very badly, and we hope today Derry can begin to bind up the wounds,” he added. There were tears of relief and joy for those who had struggled to reach this point, and all those present felt the immense release of the relatives and their supporters. Finally, one of the relatives of the victims, Jean Hegarty (sister of Kevin McElhinney), ripped up the disgraced Widgery report and threw the torn pages into the air, provoking more huge cheers.